We're thrilled to bring you this early Christmas gift of the most anticipated game of the year, just released at Zodiac Casino: The Battlestar Galactica! It’s incredible, 2012 has almost gone by, but before we enter 2013 we would like to tell you about the latest blockbuster game release and some promotions. Let’s start with a small promo at the legendary 243 Ways to Win slot, Thunderstruck II. For two years running, Thunderstruck II has remained number one in the top games chart at Zodiac Casino. Play Thunderstruck II this month and you will be credited with double points. It wouldn't be December without a festive game release from Microgaming. An updated version of Deck the Halls will bring a warm glow to the coldest of living rooms! You may remember this game title from a year ago, but it's been given an exciting tournament makeover. Try it now! But now back to the early Christmas gift of the most anticipated game of the year: The Battlestar Galactica. It has just been released at Zodiac Casino. The series behind took the sci-fi genre to another level as one of TV's most critically acclaimed shows, winning 3 Emmy awards and millions of fans worldwide. All the excitement of the gripping TV series has been transferred to this 5 reel, 243 Ways to Win video slot that is now available at Zodiac Casino. 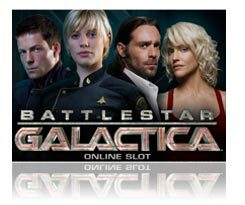 Battlestar Galactica boasts multiple game modes, each containing unique bonus features and special functionality. But try it now – we promise you will not be disappointed. Bringing Some Wildness Into Your Life!